Neal's The Hair Studio & Day Spa is an eclectic family of highly trained and creative hair stylists, estheticians, massage therapists, makeup artists, and nail technicians..
See latest styles and hair trends. 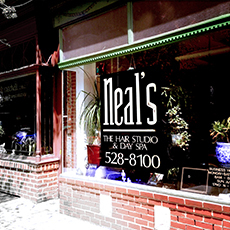 In October 1984, Neal's The Hair Studio began renting a small space in the Sutton Place Apartments. The focus then was on hair services, but the goal was always to operate a full-service salon and day spa catering to the diverse needs of all people..
Neal and partner Joe spent six years at the Sutton Place location honing their management skills while keeping an eye open for real estate in the surrounding Bolton Hill/Mount Vernon communities. It was fast becoming clear that in order to realize their dream of operating a full service salon and day spa, they would indeed have to move to a larger space. Opportunity came in the form of two small buildings in Mount Vernon, which were jointly connected by a courtyard. In October in 1990 the doors opened for business at 856 Park Avenue.